Does the Nikon D7100 digital SLR live up to its billing as an enthusiast's dream? The Nikon D7100 joins the D7000, offering 24.1-megapixel sensor, 3.2-inch LCD, 51 focus points and 100% viewfinder coverage. Can it win enthusiasts' hearts? Nikon has 16 digital SLRs in its current line up, so how does the 24.1 effective megapixel Nikon D7100 fit in? Hyped as an enthusiast's dream and a camera for amateurs who aspire to go pro, the new model doesn't directly replace the Nikon D7000 predecessor - at least for now - but does slot in as its new 'DX format' flagship model. 'DX' is the term by which the manufacturer refers to its consumer models incorporating an APS-C format chip, as opposed to the physically larger full frame sensor used in pro DSLRs costing £2K upwards, which Nikon terms FX format. The manufacturer has removed the traditional low pass filter from this camera, as it did with the pricier Nikon D800E DSLR pitched at commercial photographers. Such a filter prevents unwanted artefacts creeping into an image but can sacrifice some detail as a result. Current competitors' own flagship APS-C sensor incorporating DSLRs include the Pentax K5 II, Canon EOS 7D and the Sony SLT-A37 or SLT-A77. Plus, if portability is an issue but semi pro results are still the aim, you might also want to look at a compact system camera alternative, such as the Canon EOS M or Sony NEX-6 which also feature APS-C chips. Back to the Nikon D7100, and, held in the hand, it at least feels like it's worth a semi-pro asking price. This is due to a durable weather-proofed build with magnesium alloy top and back plates, nicely rounded and firm hand grip, plus top plate LCD for accessing the most commonly used settings. We had the Nikon D7100 supplied as a set that comes with an all-encompassing 18-105mm Vibration Reduction equipped zoom lens, which is an ideal jack of all trades option out of the box. But are body plus lens worth a manufacturer's suggested cost of a not inconsiderable £1299.99? This flagship Nikon's controls are pretty much the mix we'd expect to find on any digital SLR. So we get the standard chunky feel shooting mode dial with its smattering of manual and fully auto settings, plus a main shutter release button on the uppermost slope of the handgrip. Here it's helpfully encircled by the on/off switch so we were able be up and shooting in just a couple of seconds. There are also command dials set into the top of the handgrip at the front and rear thumb position, to enable menu settings to be easily and quickly scrolled through. Utilised in tandem with these, a physically larger pro DSLR might have found room to group dedicated ISO, white balance and image quality buttons around the small top plate LCD window. But here they're present and correct in a strip running down the left hand side of the main 3.2-inch rear plate LCD, meaning they're reachable with the thumb of the left hand when gripping the camera in both and raising it to eye level to squint through the optical viewfinder, here providing a full 100% field of view. The alternative for composing shots is to press the 'LV' Live View button bottom right of the back plate, which flips the internal mirror mechanism out of the way and allows the main LCD to be used for composing photos or video too. This button is located where it falls under the thumb of the right hand, and is in turn encircled by a switch for flicking between stills and 1920x1080 pixels video mode. There is no video option on the top plate shooting mode dial, but there is a dedicated - if unmarked - red record button next to the shutter release to kick start recording only once in Live View mode. As shooting video is a three-step process, the instant recording offered by CSCs and Sony SLT cameras means they still have the edge for amateur videographers. However the 60+ lens options open to users of the D7100 means that it is worth serious consideration nonetheless, plus there's both a built-in stereo microphone and a port for adding an accessory mic. As mentioned the D7100 offers up a fixed, non-angle adjustable 3.2-inch LCD in regular 4:3 digital image aspect ratio on the back plate. Befitting a model around the £1,000 mark, there's also the aforementioned second, narrower window on the top plate. This offered us a short cut to accessing key shooting settings without having to glance at the back of the camera. Whereas most DSLRs offer up an LCD screen resolution into the hundreds of thousands, the Nikon D7100 pushes the boat out by offering an impressive 1,228,800k dots, should users wish to use it as a focusing tool via Live View mode, rather than just for reviewing captured images. An angle adjustable screen to enable more unusual angles when shooting video might have been helpful, but we were able to live without it. The D7100 comes with a chunky rechargeable EN-EL15 lithium ion pack which slots into the usual space in the base of the handgrip. A separate memory card slot is alternately located at the camera's right-hand side, with space for two SD cards. A standalone mains charger and plug is also provided out of the box for replenishing power, though the performance of the supplied battery - even in temperatures hovering around the zero mark - is pretty impressive at around 950 shots. That's commensurate with a camera in this price bracket. The 24.7MP chip in the D7100 delivers a maximum resolution of 24.1 megapixels, but first off it has to be said our testing conditions for this camera weren't ideal - dark, grey skies in the middle of the day. Even so, despite a comprehensively broad 51 selectable focus points being available to the user, at times we felt the picture quality here was on a par with what we'd expect from a consumer level DSLR costing £500 upwards, especially if examining JPEGs straight out of the camera, though naturally there's the option to capture Raw files too, giving the user more option for adjustment. Shooting against featureless wintry skies it was disappointing to see instances of pixel fringing between areas of high contrast in an image - visible as purple/blue outlines - but then again this is true of 90% of digital cameras. In terms of that extra promised detail, with the 18-105mm test lens attached we were able to achieve a pleasing degree of sharpness into the corners of the frame - except when deliberately choosing on-board effects filters, of which there are a smattering, including the ubiquitous miniature mode. This keeps a narrow central band of the image in focus and artistically blurs the rest for some quite effective results if choosing the right subject. Overall, though we weren't completely blown away by the image quality in admittedly unfavourable conditions, the D7100 certainly delivers a respectable performance, maintaining detail into the shadows plus natural colour. The same is true when using the D7100 for recording video, which possesses a very life-like quality, while the integral stereo microphone rather than the usual mono variety is a nice touch. However as with all built-in microphones it does pick up the noise of the camera mechanisms being touched and handled when shooting in quieter environments. Also, you'll want to practice adjusting focus manually if swapping between subjects during recording. 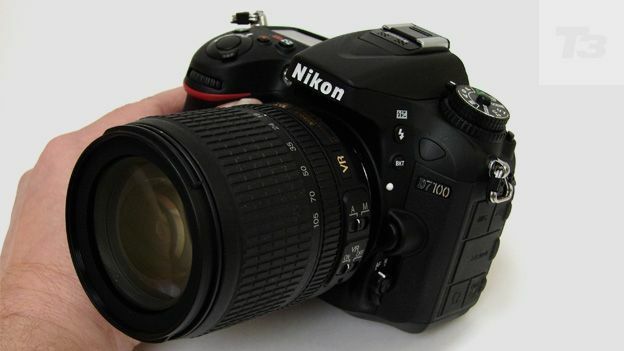 The traditional looking 24.1 megapixel 'DX format' flagship D7100 offers up some pro-like specifications with a handling experience somewhere between consumer model and one costing three or four times the price. However, unless you really would benefit from the high-ish pixel count on offer for larger prints, plus the extra teeny bit of detail eeked out by the omission of a low pas filter here, the resultant image quality is arguably not massively better than a digital SLR that can be bought for around £550-£650, such as the brand's own Nikon D5200. This is because the D7100 features the same APS-C format sensor at its heart. Take a look also at the Pentax K5 II. Ultimately then this DSLR comes across as a quite serviceable model for amateurs who fancy themselves as professionals, rather than a budget replacement for say, a D800. The latter is instead suggested by the full frame sensor incorporating Nikon D600 - the next DSLR up in the range, yours at a price of around £1700.